Hello and welcome to the 496th installment of the SWD. Syrian Democratic Forces captured Al-Ismail, Al-Aqra, Bir Mazal, Bir Dahamad, Al-Jarjari, Al-Halluni, Al-Bujari, Abud al-Jadan, al-Khinzir, Bir Zuqum, Bir Umm Ghurba, Qarat al-Moutab, Umm al-Rus, Sabkhat al-Sahil, and Kisham in southern Al-Hasakah from the Islamic State. Improvised explosive device killed one and wounded six civilians in the city of Al-Shaddadi, south of Al-Hasakah. Hayat Tahrir al-Sham arrested Islamic State’s security leader, Abu Hassan al-Masri in the governorate. Al-Masri was reportedly involved in several assassinations and improvised explosive device attacks. Syrian Arab Army and allies captured Sayda, Al-Bassah al-Gharbi, Al-Nuaymi, Sadd Jisr al-Ruqqad, Ayn Dhakar, and Abu Hartayn villages in southern Al-Quneitra from the Islamic State-affiliated Jaysh Khalid ibn al-Walid. Islamic State conducted several suicide attacks in the city of Al-Suwayda, and launched several large attacks on villages east of the city. According to the reports, the suicide attacks killed at least 140 and wounded around 200 civilians, while the Islamic State’s Amaq Agency stated that 170 were killed and 200 wounded. 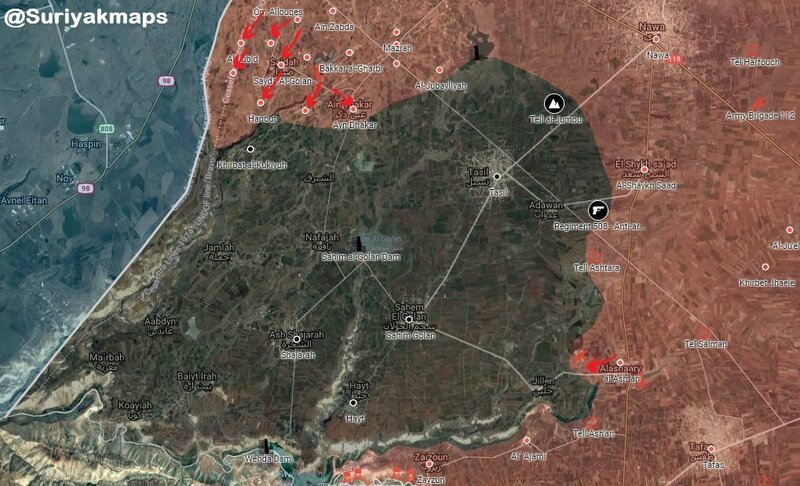 Syrian Arab Army and allies managed to resecure all of the attacked villages, including; Shuraihi, Shabki, Rami, Busan, and Duma, while several dozens of Islamic State’s elements were killed in the encounters, with several reports claiming that as high as around 80 elements were killed. Islamic State’s Amaq Agency stated that three Syrian Arab Army’s vehicles transporting elements were destroyed with RPGs in eastern Al-Suwayda. Islamic Emirate of Afghanistan (Taliban) and the Islamic State continued clashing in Bibi Maryam and Sardar areas of Derzab district, with reports suggesting that four elements of the Islamic Emirate of Afghanistan were killed and two wounded in the clashes. Islamic State’s improvised explosive device reportedly killed ten elements of the Islamic Emirate of Afghanistan, including Islamic Emirate of Afghanistan’s chief of Sancharak district (in Sar-e Pol Province), Mawlavi Shaker. Improvised explosive device wounded four civilians in the 5th Police District of the city of Jalalabad, capital of Nangarhar Province. Islamic Emirate of Afghanistan ambushed and arrested ten elements of the Afghan Local Police in Pay Baisha area of Chahar Sada district. Islamic Emirate of Afghanistan attacked and damaged an Afghan Local Police’s checkpoint in Alam Khel area of Muqur district, reportedly killing four policemen. Islamic Emirate of Afghanistan attacked an Afghan National Army’s convoy in Nani area of Andar district. Four elements of the Afghan National Army and a vehicle were destroyed in the attack. Afghan National Security Forces cleared the villages of Malzi and Turkariz in Tarinkot district from the Islamic Emirate of Afghanistan, as well as destroyed ten group’s improvised explosive devices in the aforementioned villages. Islamic Emirate of Afghanistan ambushed and killed Afghan Local Police’s commander, Tala Muhammad and two other elements, as well as wounded one element of the police in Kala Khel Killi area of Shah Joy district. One element of the Islamic Emirate of Afghanistan was killed in the encounter. Afghan National Security Forces cleared Haji Qiyum and Haji Aziz areas in Jerashk and Garmsir districts from the Islamic Emirate of Afghanistan, also discovering and destroying 32 improvised explosive devices. Islamic Emirate of Afghanistan attacked an Afghan National Army’s post in Nawrozo Killi area of Nad Ali district, killing and wounding five soldiers. Islamic Emirate of Afghanistan’s snipers killed and wounded six elements of the Afghan National Security Forces in Zar Pul and Parchawi areas of Nad Ali district.